Where do I use my Simply Supplements voucher code? Follow our link to the Simply Supplements website and browse for your goods. Select your products and click ‘Add to basket’, then ‘Proceed to secure checkout’ once you’re finished shopping. Paste your copied promo code in the ‘Enter Offer Code Here’ box beneath your order and click ‘Apply Code' to enjoy your savings. Click ‘secure checkout’ to complete your purchase. Refer a friend and you can both receive a great discount of your orders. Be sure to take a look at the sale section, for some fantastic discounts on popular products. Simply Supplements are one of the biggest retailers of vitamins and minerals in the UK and offer a lowest price guarantee, selling over 300 products ranging from traditional vitamins and minerals like multivitamins, cod liver oil and omega 3 fish oils, to highly specialised products such as ginkgo biloba, glucosamine, chondroitin and bespoke herbal teas. Before you buy products from Simply Supplements make sure you head to Netvouchercodes for a money-saving discount code. Using a discount voucher code from Simply Supplements is a great way to save money on your order. Codes offer a discount on select products such as "40% saving on African Mango 5000mg" or "Save 20% off Jasmine Essential Oil" or give you a generic saving e.g. "5% saving off your order" Just enter the discount code for Simply Supplements at the website's checkout stage to see an instant discount. Don't forget to check here at Netvouchercodes before you order to see what discount codes or money saving offers are available. Cod Liver Oil is rich in the omega 3 fatty acids and vitamins A and D. Cod liver oil supplements are ideal for general health and well-being because they support: heart health, joint function, brain function, immune system and keep eyes and skin healthy. At Simply Supplements you will find cod liver oil capsules available in 550mg or 1000mg. All of their cod liver oil is sourced from sustainable practices and then distilled to guarantee it's freshness and purity. Their Cod Liver Oil 1000mg capsules contain high levels of EPA, DHA, and vitamins A and D, and are great value for money. Menapol™ Plus is a herbal complex to help ease women who are going through the menopause. Simply Supplements Menapol™ Plus capsules are manufactured in the UK to EU standards, and so their quality and potency are guaranteed. The formula, which consists of Red Clover, Liquorice extract, dandelion root, acai berry, Soya isoflavones, chamomile extract, cranberry extract and Siberian ginseng is designed to nourish and revive a tired body by assisting the body’s systems to maintain a natural equilibrium. Yes, students can receive a discount on all orders through their Student Beans account. How will I know how many capsules or tablets will be in each product? The amount of capsules or tablets are clearly marked on each individual product page. In the case of any buy one get one free promotions the amount of tablets you wil receive in total will be the amount you see within the brackets. Am I able to buy any pet products alongside my own supplements? Yes Simply Supplements offer a great range of pet products under the VitaPaws brand which can be found here. Simply Supplements sells high-quality health supplements such as minerals and vitamins at huge discounts compared to high street prices. Use a Simply Supplements discount code and you could save even more. 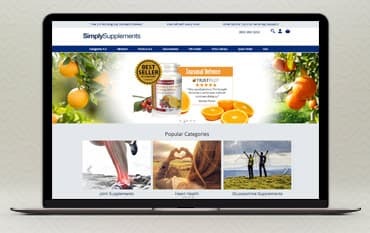 Simply Supplements sells loads of products ranging from multivitamins, cod liver oil and omega 3 fish oils, as well as highly specialised products such as chondroitin, ginkgo biloba and glucosamine. They also stock a range of bespoke herbal teas. We are constantly on the hunt for first order Offer Codes for Simply Supplements to help you with your money saving. Our experts check dozens of sites for secret codes including NHS discounts, student sites & social media channels saving you time & money!